“The Synod Fathers reaffirmed the importance of popular piety in the handing on and the growth of faith. As my predecessor of venerable memory Pope Paul VI once said, popular piety is rich in values both in reference to God and to our brothers and sisters, and thus constitutes an authentic treasury of spirituality in the life of the Christian community” (n. 40a). The Bishop’s concern for the devotional life of his people is an integral part of his care for their prayer life and their participation in the worship of the Church. Most of all, it is a part of his care that the faithful participate fully in the celebration of the Holy Eucharist, for the devotional life is the way in which we extend our communion with Christ in the Holy Eucharist to every aspect of our lives. At the same time, our devotional life stirs up in us the desire for participation in the Holy Eucharist and prepares us to take part in the Eucharistic Sacrifice. It is important to recall that true devotional life also leads to a desire both to know the faith more fully and to communicate the faith to others, according to our call to be missionary and to be promoters of Christian unity and interfaith understanding and cooperation. The devotional life very much inspires and sustains the witness of justice and charity in our lives. 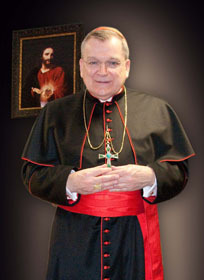 Our Holy Father has given an excellent summary of the richness of meaning of devotions in the Christian life: “The faithful, through popular piety, should be led to a personal encounter with Christ and to fellowship with the Blessed Virgin Mary and the saints, especially through hearing the Word of God, recourse to prayer, participation in the Church’s sacramental life, and the witness of charity and the works of mercy” (Pastores Gregis, n. 40d). Popular piety gives concrete expression to our communion with all the saints, the communion which has its source in Christ’s love for us and our love for Christ. In teaching about devotions, the Second Vatican Ecumenical Council reminded us, in the words of Saint Paul, that we are to pray without ceasing, so that we may live always in the company of Christ and bring Christ to others at all times and in all places. We pray at Holy Mass that Christ, Who gives Himself totally to us in the Holy Eucharist, may make of us a total gift of love to God and our neighbor. Our devotional life helps us to be reminded throughout the day and in the various places of our daily activity that we are called to offer our lives, with Christ, to God and one another (cf. Second Vatican Ecumenical Council, Constitution on the Sacred Liturgy,Sacrosanctum Concilium [Dec. 4, 1963], nn. 12-13). “It is the Bishop’s duty to regulate them, to encourage them as an aid to the faithful for Christian living, to purify them where necessary and to evangelize them” (Pastores Gregis, n. 40e). Down the Christian centuries, false devotions have been introduced, which have led the faithful away from Christ. The Church studies the various popular devotions which arise, in order to be sure that they are fully coherent with the doctrine of the faith and her discipline. At the same time, the Church commends certain devotions to us. The Second Vatican Ecumenical Council tells us: “Popular devotions of the Christian people, provided they conform to the laws and norms of the Church, are to be highly recommended, especially where they are ordered by the Apostolic See” (Sacrosanctum Concilium, n. 13a). The more closely we grow in the likeness of Christ, we desire to be in His company throughout the day, especially through prayer and devotions. One thinks, for instance, of morning prayer and evening prayer, prayers before and after meals, the Angelus, visits to the Blessed Sacrament and making the Sign of the Cross when passing before a church, the rosary and the Divine Mercy Chaplet, the Stations of the Cross, prayers said when hearing a siren or seeing an ambulance, lighting a blessed candle during a storm, and a host of other devotional practices which help us to keep company with Christ. I recall the homily which Pope John Paul II gave at the Solemn Pontifical Mass on the second day of his historic pastoral visit to the Archdiocese of Saint Louis in 1999. In particular, I recall how our Holy Father drew us, through his homily, to the Sacred Heart of Jesus, “the door through which the eternal love of the Father is poured out on the world” (Pope John Paul II, Homily, Solemn Eucharistic Celebration, America’s Center, Saint Louis, Jan. 27, 1999, n. 1c). Our Holy Father reminded us that our fullest union with the Heart of Jesus in this life is through the Holy Eucharist, participation in Holy Mass and Eucharistic devotion. Truly, Christ seated at the right hand of the Father never ceases to pour out, from His glorious Heart, the riches of God’s grace upon the Church and us, her members, especially through the celebration of the Holy Mass. Having called to mind the Holy Father’s words about the Sacred Heart of Jesus, I urge the practice of devotion to the Sacred Heart of Jesus as an expression of Christ’s Kingship in our hearts and in our world. I urge the Enthronement of the Sacred Heart in homes and other institutions of which we are a part: “Placing our hearts within the Sacred Heart of Jesus through participation in the Holy Eucharist and Eucharistic devotion, let us enthrone the image of His Sacred Heart in our homes and places of work and recreation, consecrating ourselves and all that we do to His service. The Sacred Heart devotion is a most fitting and efficacious way of extending Eucharistic worship and devotion into every moment of our lives and every aspect of our lives” (n. IVb). The Enthronement of the Sacred Heart of Jesus is a true way of living always in the company of Christ Who gives us His Body and Blood in Holy Communion. The image of the Sacred Heart reminds us that Christ is alive for us always in the Church. We need only to approach Him Whose glorious Heart never ceases to beat with deepest love of us. It is my hope that every home will enthrone the Sacred Heart of Jesus, if it has not already done so. To that end, I write about the devotion to the Sacred Heart of Jesus and the Enthronement. The reflection is particularly timely as we celebrate Christ’s Ascension to the right hand of the Father and prepare to celebrate, on Pentecost, the outpouring of the Holy Spirit upon the Apostles and, through the Apostles, on all of the disciples. Following Pentecost Sunday, we celebrate a number of solemnities which express the richness of Christ’s living presence with us in the Church: the Solemnity of the Most Holy Trinity, the Solemnity of the Most Holy Body and Blood of Christ, and the Solemnity of the Most Sacred Heart of Jesus. It is my hope that the reflection which I offer on the devotion to the Sacred Heart of Jesus will help us in celebrating these important solemnities and in living faithfully in the company of our Risen Lord in our homes. Our Lord Himself has provided us with a most wonderful way to welcome Him into our homes. From 1673 to 1675, He appeared to Saint Margaret Mary Alacoque, a nun of the Visitation Convent at Paray-le-Monial in France. He revealed to Saint Margaret Mary the great mystery of His infinite love for us, represented by His Sacred Heart. He asked that homes be consecrated to His Sacred Heart as a sign of His living presence with us in the Church, especially through the Holy Eucharist. The practice of the Enthronement of the Sacred Heart of Jesus in the home was begun by Father Mateo Crawley-Boevey of the Congregation of the Sacred Hearts of Jesus and Mary. His work was first confirmed and blessed by Pope Saint Pius X and then by every Pope since. When Pope Saint Pius X heard of the Enthronement, he told Father Crawley-Boevey directly: “To save the family is to save society. The work you are undertaking is a work of social salvation. Consecrate your life to it.” Father Crawley-Boevey could not mistake the importance which the Holy Father gave to his apostolate of the Enthronement of the Sacred Heart of Jesus. What the saintly Roman Pontiff declared to Father Crawley-Boevey in 1907 remains true in our time. If the company of Christ is cultivated in our homes, His company will be cultivated in every sector of life for the transformation of our society and of our world into a civilization of love. The Enthronement is bound essentially to the Holy Eucharist, for it aims to bring Christ, truly present on the Altar of Sacrifice and in the tabernacles of our parish churches, into our homes. It aims to unite the altar and tabernacle of the parish church with the altar and tabernacle of devotion in our hearts and in our homes. The whole meaning of the devotion is to extend the grace of the Eucharist into the Christian home and from the Christian home to the whole world. The image of the Sacred Heart of Jesus expresses the true Kingship of Christ Who rules over us by giving up His life for us. It daily reminds each member of the family to follow in Christ’s royal way by making reparation for sins committed and by striving to serve God and neighbor more lovingly. Father Crawley-Boevey spoke of the Enthronement as the “official and social recognition of the rule of Jesus over the Christian family” (Mateo Crawley-Boevey, SS.CC., Jesus King of Love, Fairhaven, MA: National Enthronement Center, 1997, p. 125). Once the Enthronement has taken place in the home, each family member has the occasion daily and, perhaps, many times daily to gaze upon the Face of Christ and to have Christ gaze upon his or her face. Looking into the Face of Christ, all of the various moments of daily living are seen in their lasting importance, they are seen in the perspective of the eternal life which is to be ours. The Enthronement is not merely the placing of a sacred object in the home. It is not only an act of veneration of the image of the Sacred Heart of Jesus. The Enthronement is a way of life, the acceptance of Christ as King of my heart, as my constant Companion, as my Friend, helping me and guiding me in the small and big matters of daily life. As Bishop of La Crosse, I urged very much the Enthronement of the Sacred Heart of Jesus, especially on the occasion of the celebration of the Great Jubilee of the Year 2000. As families began to enthrone the image of the Sacred Heart of Jesus for the first time or to renew the Enthronement which had taken place years ago in the home, I received reports, both directly and by letter, recounting special graces received by the family members. The reports testified to the grace which comes to a home which makes the Enthronement of the Sacred Heart of Jesus a way of life for every member of the family. I offer two examples. One man whom I will call Joseph told me personally about the situation of his neighbor, a devout Catholic who was dying of a painful form of cancer. The neighbor was suffering physically and was also psychologically very agitated. His wife was most concerned, especially as he was nearing death. Joseph suggested to the man and his wife the Enthronement of the Sacred Heart of Jesus in the bedroom in which the man was undergoing his agony. After some days of preparation, the Enthronement took place. After the Enthronement, the neighbor suffering from the cancer received a wonderful grace of peace, which he enjoyed until his death some days later. A father and mother wrote to me after the Enthronement of the Sacred Heart in the home. They had two teenage children, a young man and a young woman, who were often disagreeable with each other and with their parents. The family prepared for the Enthronement which they carried out on Good Friday. The parents wrote to tell about the new attitude of respect for each other and for the parents, which the teenage children were manifesting after the Enthronement. Surely, the Enthronement of the Sacred Heart had helped the young people to draw upon the grace of the Holy Eucharist to live more fully in the company of Christ. Next, I will continue to reflect upon the Enthronement of the Sacred Heart of Jesus in the home, also giving the practical details about how to prepare for the Enthronement and how to celebrate properly the Rite of the Enthronement. Let us pray for an ever more perfect union of our hearts with the Sacred Heart of Jesus. Let us with Mary, place our hearts, with all of their joys and burdens, in the Heart of Jesus, the only source of our healing and peace. O Sacred Heart of Jesus, formed by the Holy Spirit in the womb of the Virgin Mother, have mercy on us.